Harking from a period when comedy was uncomplicated and well, let’s say… simple, Baldwin the Fool and Godfrey Pugh never fail to delight audiences with their brilliant blend of medieval mischief and slapstick comedy. These jesters replicate entertainment as it would have been performed to the old courts of days gone by, when chivalry was the order of the day and valiant knights fought one another to defend their honour! 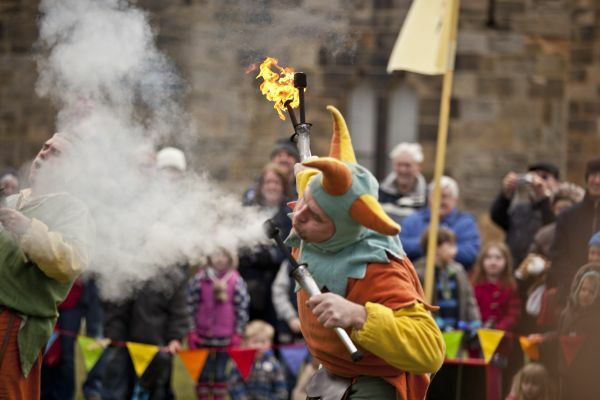 Witness medieval mischief and wonderous circus tricks, performed by this highly interactive and comical act, which is bound to have you laughing, cheering and even weeing (don’t worry, it’s just a sound effect you’ll be making during the show)! So why not come and observe what would have entertained the Lords of Ladies of days gone by, in the shadow of the majestic Alnwick Castle. Zooted the Jesters theatrical performances are held on multiple dates throughout Alnwick Castle’s opening season. These brilliant and hilarious shows are free with admission to Alnwick Castle! Please check the ‘What’s On’ board upon arrival for show timings and locations, as these can vary throughout the season.